In "Animate Objects" labor-intensive carbon drawings appear to gain strength the more they venture into the realm of the abstract. 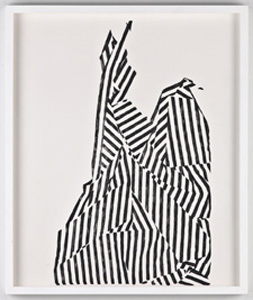 Chris Oatey's previous works, drawings of what looks like striped pieces of paper, crumpled, were actually derived from the shape and outline of photographed subjects. But this work is no longer anchored by any pretense of representation, and it takes on a life of its own. One untitled piece that uses Oatey's favored technique of lining paper by tracing on top of carbon paper, is as heavily ruled as a yardage of corduroy and with even more heft. Surprisingly, this heavily-worked piece of paper, creased and apparently haphazardly framed, really has the presence of a sculpture. This is certainly an avenue that Oatey should explore further.